Reading about this made my day! I love the Promenade Plantée in Paris and want to explore the High Line in NYC and now these Green Alleys in Montreal! Great idea! 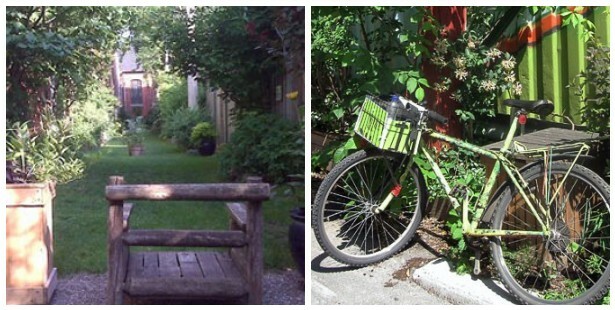 The Montreal borough of Mercier-Hochelaga-Maisonneuve is working on making its alleyways a friendlier place to be — both for local residents and the environment. The neighbourhood, located in the east end of the city, said Wednesday that it would invest $20,000 to plant flowers and trees in four alleys this year. Borough mayor Réal Ménard said the initiative is designed to make the areas more inviting to the public, creating spaces for people to sit and relax. "It's a gathering event for [people]," he said. The increase in foot traffic will also discourage criminals and drug users because they will be unwilling to break laws in the presence of other citizens, Ménard said. With the addition of four new green alleyways, the borough will have a total of eight. The project was started in 2010 and Ménard said more are planned for next year. Although the project — which started in 2010 — is organized by the Maisonneuve Longue Pointe Eco-Centre, volunteers actually do the landscaping. "They're the ones who are going to build the boxes that the flowers are going to be in," said Anne Gosselin from the centre. "They're going to be planting trees, They're going to paint the streets." Gosselin said the alleys have been a success and help to mitigate heat coming from the asphalt. "They offer a nice place for people to spend time," she said. And it is residents who get to decide which alleys will be greened, Gosselin said. Mercier-Hochelaga-Maisonneuve isn't the only neighbourhood looking to make its thoroughfares a nicer place to be. On July 6, the nearby borough of Plateau-Mont-Royal, also said it would invest $137,000 to build five eco- and citizen-friendly alleyways. There are similar initiatives throughout Montreal, and a total of 100 streets have been transformed into green space.